"Wouldn't it be great if . . ." You are the kind of person who loves to peer over the horizon. The future fascinates you. As if it were projected on the wall, you see in detail what the future might hold, and this detailed picture keeps pulling you forward, into tomorrow. While the exact content of the picture will depend on your other strengths and interests -- a better product, a better team, a better life, or a better world -- it will always be inspirational to you. Practice. Choose your words carefully. Make the picture as vivid as possible. People will want to latch on to the hope you bring. Find a friend or colleague who possesses this theme. Set aside an hour a month for "future" discussions. Together you can push each other to greater heights of creativity and vividness. 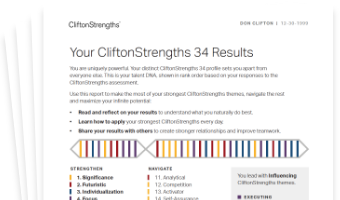 See how Futuristic shows in your CliftonStrengths results -- discover All 34 CliftonStrengths Themes today!